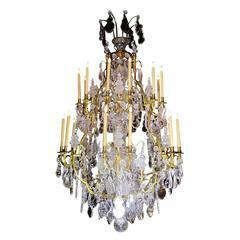 A large and impressive George III style cut-glass twenty-light chandelier. English, circa 1910. The shaped, diapered cut, glass bowl issuing spiral rods suspending faceted drops, swags and chains above a slender baluster stem and bowl, issuing two tiers of twenty S-scrolled spiral cut arms with moulded drip pans hung with faceted drops, with a drop-hung canopy below with a facet cut pendant terminal. 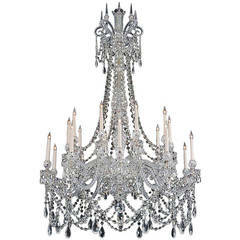 A large 20th century cut-glass twenty four-light chandelier in the Louis XVI manner hung with a profusion of cut-glass bead chains and faceted pendants. French, late 20th century. 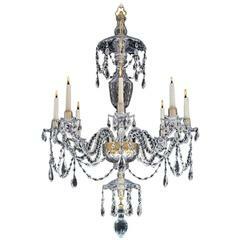 Magnificent all original mint condition crystal George III chandelier, eight lights.